Set to arrive in homes and stores October 7th as the fall season gets fully under way. Cover images by Gary Lange and Hans-Georg Evers. DEADLINE for materials to be included in this issue: Friday, September 12th. The issue will reach homes and stores in the first week October, 2014. Expeditions searching for new rainbowfishes (Melanotaenia, Chilatherina) and blue-eyes (Pseudomugil) species in remote jungle streams and pools. Contributions by world-renowned experts: Heiko Bleher, Dr. Gerald Allen, Jeffrey Christian, Hans Evers, Johannes Graf, and Gary Lange. Many glorious new species, color forms, and never-before-published images. 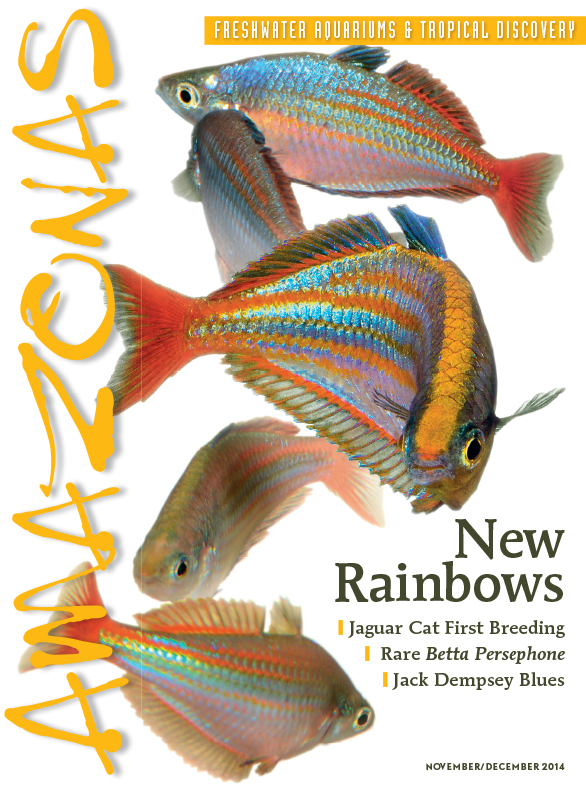 Hands-on advice on breeding rainbowfishes, sourcing rare species, and preserving true wild-strain fish that have not lost their distinct beauty to mass propagation and hybridization. MUCH MORE: Electric-Blue Jack Dempsey Cichlids, history-making first breeding of the prized Jaguar Catfish, an introduction to the rare black Phantom Betta persephone, captive-bred albino Hypancistrus sp. L400 Belo Monte plecos, and more. Cover Image Credits: Wapoga Red Laser Rainbowfish, Melanotaenia sp. Center fish: Gary Lange; others: Hans-Georg Evers. More about this stunning new species in the September/October issue of CORAL. The print edition of AMAZONAS in English is distributed in the United States, Canada, the United Kingdom, Australia and New Zealand, South Africa, France, India, the Netherlands, Malta, and elsewhere. The Digital Edition is read in more than 100 countries worldwide. To find a local or regional dealer who offers AMAZONAS Magazine, visit our current Source Directory. CORAL is published bimonthly by Reef to Rainforest Media, LLC in Shelburne, Vermont, in partnership with Natur und Tier –Verlag GmbH and Matthias Schmidt Publishing, Muenster, Germany. Looking forward too the Nov/Dec issues. This a great Magazine.